Urgent Notice – Cancellation of Competition. Due to a very small number of applicants this year the organisers felt that it would be best to cancelled the Tony Fell Musical Theatre Prize for 2018. The finals will therefore not be held at The Sylvia Young School on Sunday May 13th. The Thompson Educational Trust sponsors the 2nd and 3rd Prizes of £500 and £250. The competition is to be held in London on Sunday, May 13th 2018 at the Sylvia Young Theatre School, 1 Nutford Place, London W1H 5YZ. Selected prize winners will be offered the opportunity to perform in the AESS’s Prize Winners Concert on November 3rd 2018 as part of The London Song Festival. Competitors must be between 18-25 years old, of any nationality and be in full time training or preparing for a career in Musical Theatre. Competitors are required to perform a song and a scene/speech as a sequence in the original English which can come from any source and be presented in any order or imaginatively combined; they do not have to be from the same source. There must be a smooth transition between the two elements as though performing within the context of Musical Theatre and appropriate movement may be included as part of the performance. The programme should not exceed eight minutes. The adjudicators will require a copy of both the scene/speech and the song. Costume/props may be used. Applications must be received by May 5th 2018. 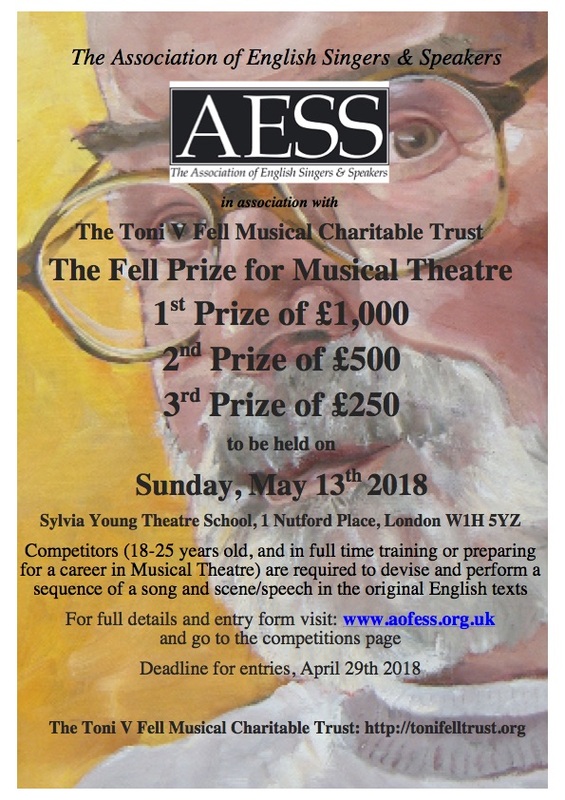 There is a non-refundable entrance fee of £20 (cheques payable to the AESS) which should be sent with the application form to The Administrator, AESS TVF Competition, 1 Hillfield Road, London, NW6 1QD. Previous winners of this competition are not eligible to enter a second time. Feedback from the judges will be given to all entrants as soon as is practicable.